Farmers Market Greens [recipe] – Cin Cin, Let's Eat! I love to explore the local farmers market on the weekends. It’s a great opportunity to learn about what’s fresh and in season, and I often feel adventurous and buy produce that I’ve never cooked with before. Lately I’ve seen so many varieties and colors of broccolini, mustard greens, and lettuces. Dark leafy greens such as kale, collard greens, and chard seem to be very IN these days. 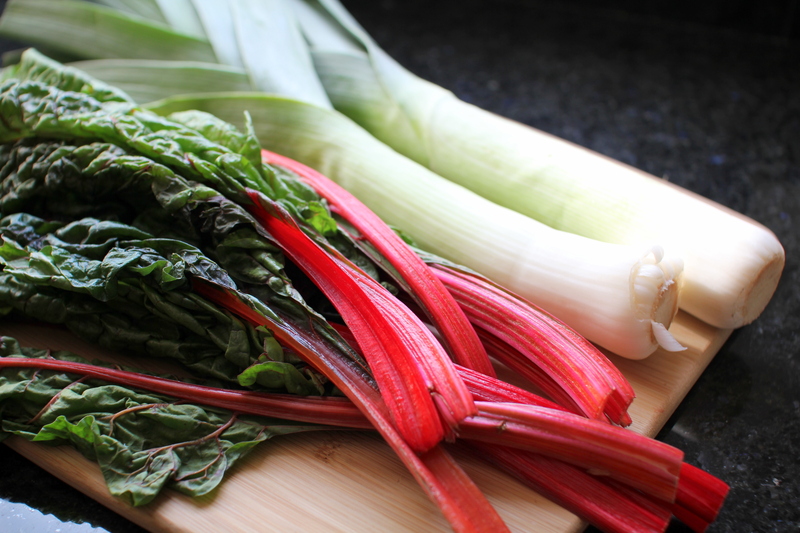 This past weekend I picked up a gorgeous bunch of red Swiss chard and leeks, for a total of $2. Awesome, right? If the vegetables I have on hand are super fresh, I go for simplicity when I cook them. In other words, cooking them in a manner that showcase their original flavors instead of hiding them in sauces with other ingredients. It never cease to surprise me how sweet vegetables can be. Swiss chard tastes earthy, like beets. Fresh and young chard can be eating raw, as in salads. I like to braise or saute them because it takes away that earthiness and bitterness. 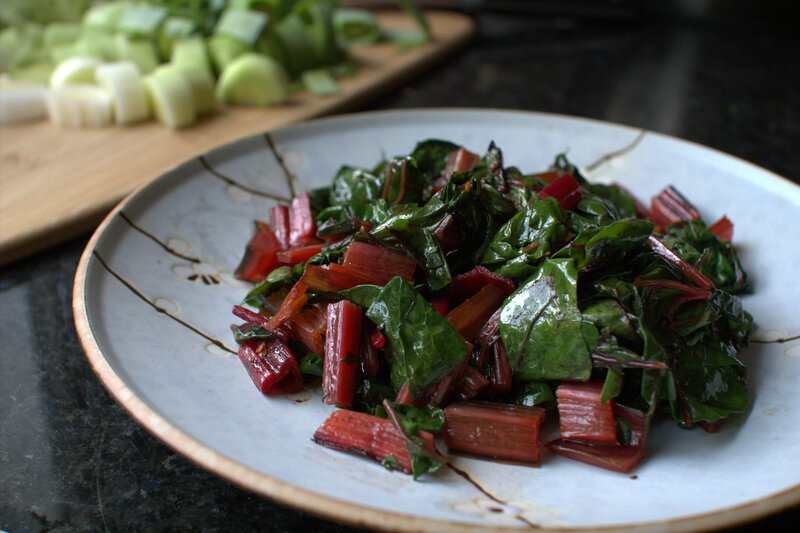 Swiss chard itself cooks fairly quickly, but I have slow-cooked them for HOURS with collard greens, along with ham hock and cider vinegar in a slowcooker to achieve that uber soft Southern greens texture. I have also used the chard in simple chicken soup, or saute them with onions and mushrooms for pastas. For this particular bunch of Swiss chard that I purchased, I just wanted to go simple. Here’s a very easy-peasy recipe. Omit the vinegar if you don’t like the taste. 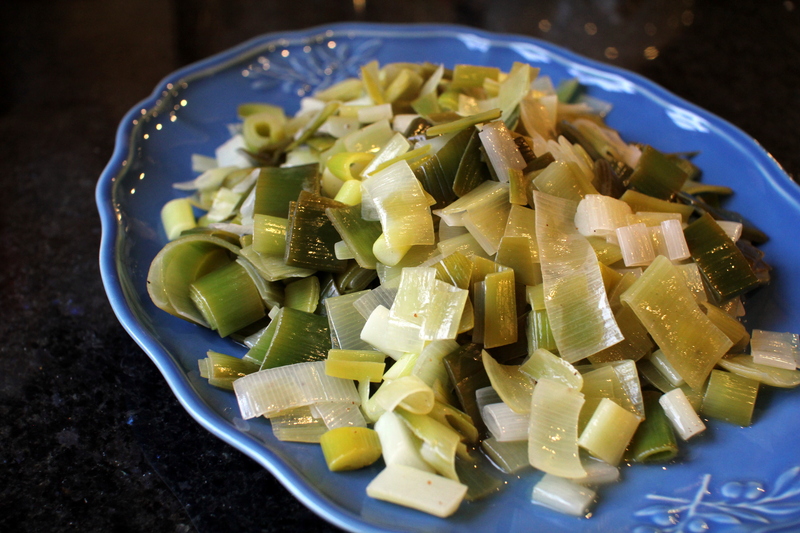 For these fragrant leeks, I chose to braise them, as the green parts sometimes tend to be tougher. I often use only the white parts of the leeks for a quick saute. They’re great in omelet and frittatas! Other times I use them instead of onions to get more nutritional values in my meals. Here’s the recipe for some delicious braised leeks. The only thing I did different was braising them for 20 minutes, covered on the stove instead of in the oven.